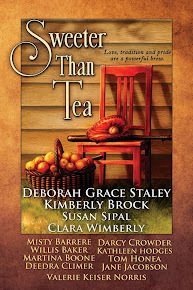 This is an article I originally posted for the awesome author Kaitlin Bevis over a year ago. Following a recent conversation on Twitter regarding the spread of myths from one culture to another, I thought it would be nice to update it a bit. 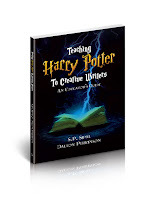 My analysis focuses on imagery rather than a written myth. Until reading and writing became widespread, iconography was the preferred method for communicating ideas and beliefs through symbols. It's fascinating to me to see how these powerful images transformed across cultures and centuries by the new people who embraced them. As a reader and a writer, I’ve been following the #WeNeedDiverseBooks campaign with a lot of interest. To me, it only makes sense that the diversity of reality is represented both on the page and on the screen. And as the mother of two kids born of a mixed ethnic, national, and religious heritage, I believe it’s important that they, and others like them, see themselves in the books they read and the heroes they admire. But this desire to see ourselves reflected in our contemporary heroes is nothing new. Indeed, it goes back to the most ancient of days when people saw themselves in the adventures of their gods and goddesses…the novels of their day. 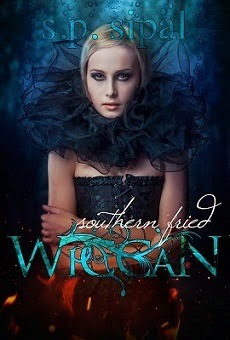 As Cilla, the main character in my YA contemporary novel Southern Fried Wiccan discovers, being able to see yourself in the divinity you worship is quite empowering. The first time Cilla saw the Divine depicted as a young, powerful woman, rather than an old, white dude was game-changing. In gazing upon Artemis of Ephesus, Cilla realized that a spark of the divine could live in someone like herself. 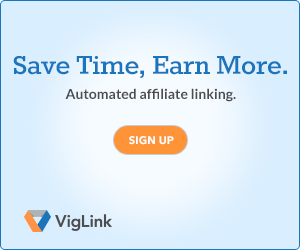 Asia Minor, or Anatolia, the home of Ephesus and the peninsula where most of modern-day Turkey now lives, is one of the major cradles of civilizations. It was here that the earliest sanctuary has been discovered, built by hunter-gatherers BEFORE settling down to farm. Here that many of the great Greek and Roman cities birthed the thinkers that pushed forward what we now call western civilizations. It was also in Anatolia that a long line of mother goddesses flourished in the hearts of her followers, worshiped by both men and women who envisioned the divine power that unites us all in the fertility of a woman’s body. In Turkish, Anatolia is called Anadolu, translated by Dr. Rashid Ergener literally as “land of the mothers.” Anatolia is indeed filled with powerful mothers, goddesses who transformed throughout history due to cultural changes. And this, to me, is where the beauty of diversity fully blossoms. Because we can see in each of these incarnations how the people of the time adapted their goddess in their own image, while still preserving a central core from the female power she preceded. 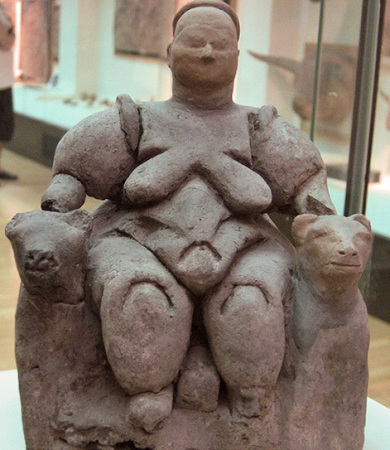 The Mother Goddess from Çatal Höyük is one of the earliest examples of mother goddess worship from Anatolia. Found in a grain bin of a Neolithic settlement over 8000 years old, this ancient female gives birth in a throne-like chair supported by lions (or leopards or panthers). She is the most famous among many similar fertility goddess figures found at this site. The beauty of this figure is in her raw, natural power. In naked glory, she brings forth life in harmony with nature. Notice she is not subjecting those felines -- they are supporting her, but still stand proud and powerful beside her. To me, she embodies eternal female power. And she must have to the ancients as well, because her legacy survived the transformations below to last until today. 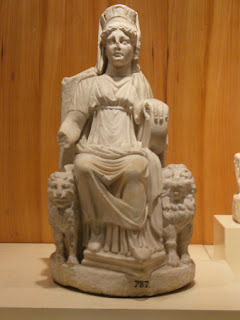 This Phrygian mother-goddess has lost a bit of weight and wears better clothes than her predecessor, but she still sits on a throne framed by lions and displays her divine power in all its wild and fertile glory. Cybele sits higher above her feline companions than does her predecessor. And her city-crown and civilized clothes now separate her more from her wild, animal companions. Is this shift a natural transformation to represent the sedentary culture of the people now worshiping her? Or is it a reflection of the rising city-state rulers seeking to harness her natural power for their own political purposes? Whether the shifting image of the goddess was a natural transformation or one controlled for a political purpose, the power of women aligned with nature and untamed by civilization continued to inspire and awe. According to legend, the Amazons are said to have founded Ephesus. It was here that the Temple of Artemis, one of the Great Wonders of the Ancient World, drew worshipers for thousands of years. In Ephesus, Artemis was viewed from a different angle than Artemis in other parts of the Greek world. That is because she draws directly from the imagery of Cybele and the mother goddess of Çatal Höyük above. While this goddess is standing in the pillar pose rather than seated on a throne, you can see that she is still envisioned as mistress of the animals with lion-like figures at her side as well as the stags, bees, and bulls depicted along her ceremonial clothes. Most people think the protrusions from Artemis’ chest are breasts, but there are other theories, such as pollen sacks (she was in part a bee goddess) as well as bull testicles (which were sacrificed to the goddess). She has grown in power both in her crown of the city as well as in her adornment of the natural world. Although Mary is not officially considered a goddess and is indeed not from the Anatolia region, it was in 431 CE at the Council of Ephesus, home of Artemis, that Mary was first given the title Theotokos (birth-give of god) and depicted with many of Artemis’ attributes and titles, such as Queen of Heaven. A church was dedicated to her in Ephesus on the ruins of a Roman temple to the Muses, and legend has it that, after the crucifixion, she traveled with John to Ephesus and lived out her days here. With the worship of Artemis now in decline, thanks to the rise of Christianity, Artemis’ loyal followers transferred their adoration to a new face of the female divine. 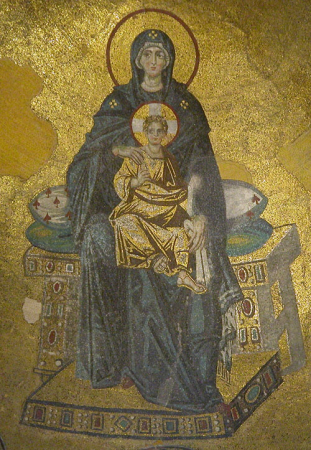 From this icon at Hagia Sophia in Istanbul, at the heart of the apse of the great Byzantine basilica, we see the same commanding mother on a throne of power. Bordering her (out of sight of this picture), she is garlanded with natural images of vines, flowers, berries and pears. Four amazing females. Four inspiring images of feminine power. Each one slightly different than the one before, re-visioned and re-clothed in the costume of her own particular culture, and yet still lit by the ancient spark of universal subconscious that brought her to life. If cultures have been reimagining the divine in their own image for millennia, why would we stop doing so today? Especially when it so profoundly affects how our children see themselves? 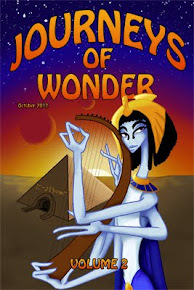 If you like this article, you may enjoy some of my posts on Egyptian Mythology.